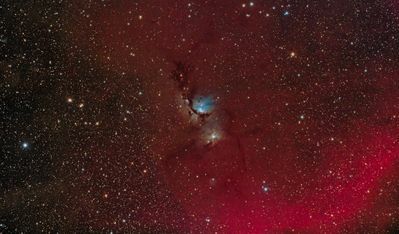 Messier 78 is a blue reflection nebula (larger nebula near the center of the image) that is found in the constellation Orion. Several other reflection nebulae can be seen in the image along with extensive clouds of dust (dark molecular cloud Orion B). The red emission nebula in the lower right-hand corner is part of Barnard's loop. Image is a total of 11 hr 30min exposure (46 x 15 min lights, dithered; 12 darks; 128 flats; 128 bias) taken on the nights of Nov 6, 2015; Jan 12, 13, 2016; Feb 8, 9, 12, 2016 with a Takahashi FSQ106ED with reducer @ f/3.6; Canon 60Da @ ISO 800; Astro-Physics 1200 mount; and Astro-Physics/Baader 60 mm guider (SBIG ST-i); Processed with PixInsight 1.8.4.1195 (with Bayer drizzle algorithm).